Wow glad I'm not the only one that didn't like the movie! Well to be honest I did enjoy the movie, but it's a bit of a no-brainer! Yeah, can’t say that I was enamored of this one. I wanted to like it, in part because I enjoyed Casino Royale and thought that Craig made an exceptionally good James Bond. And the idea of making a slightly darker, more psychologically complex Bond sounded kind of interesting. 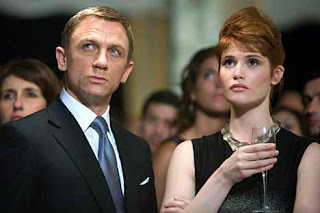 Well, I still like Craig, but I’m having second thoughts about that ‘darker Bond’ thing. I miss some of the the Bond humor and flair. Or maybe it was just that director Marc Forster seemed to be trying too hard to imitate the Bourne franchise. Let Bond be Bond. And while I certainly don’t advocate a return to the invisible car and unstoppable camp of Die Another Day, a little wit would be nice. I think she dis say something in castillian, but I'm not sure. One thing I got disapointed was the the final scene had a lot of things to exploit, but it ended to soon. Not only because he was facing the killer of his girl, but because then he could reveal his weaknesses, which he've been refusing to admit during the movie. It could have been another poker scene, but with things that are more important for the character. I saw it yesterday, she talks in castillian to de bolivian general.